As St. George flags start popping up everywhere and the nation’s mood swings back and forth between pessimism and… slightly less pessimism, it’s hard not to get caught up in World Cup mania. Right now, football managers across the globe are figuring out their line-ups and tactics. As an employer, you also need to decide how you’re going to approach the tournament. Do you give your employees free rein to watch every single game? Or do you take a defensive approach and try to block all mention of football? The winning strategy is probably somewhere between the two extremes, where you balance the needs of your business and the happiness of your staff. The best way to put this strategy into action is by creating a sporting event policy. This policy should remind your employees of your existing rules and regulations, while also outlining any exceptions you might be making for the tournament. You can then use this policy during other events like the Rugby World Cup and the Olympics. The good news for employers in England who operate on a Monday-to-Friday, 9-5 schedule is that none of the Three Lions’ games will take place during office hours, even if they go all the way to the final (yes, it could happen). Even so, you might still employ foreign workers who want to cheer their country on, or employees who are obsessed with football no matter who’s playing. You could allow these employees to leave a bit early to catch the game as long as they make up the hours, for example, by coming in earlier on the day. An employee might also ask if he can take a whole afternoon off to watch a game. Consider relaxing any restrictions you have on last-minute holiday requests. And remember, if too many employees ask for time off, you’re within your rights to turn down requests for leave if you don’t think your business will cope. Your sporting event policy should also mention what consequences employees will face if you catch them pulling a sickie to watch a game. Thanks to smartphones, tablets and streaming websites, it’s never been easier to watch football wherever you are. On the one hand, if you allow staff to watch games on their own devices, they’ll be less tempted to call in sick. But on the other, you’ll be opening the door to other distractions like Facebook and Twitter. One way to get around this is to install a TV and show matches in your communal area. It may sound counterintuitive, but if the game is on in the background, employees won’t feel the need to look at their phones. It also makes it easier for you to notice if staff are taking advantage. While football is meant to be fun, it has been known to bring out the worst in some people. 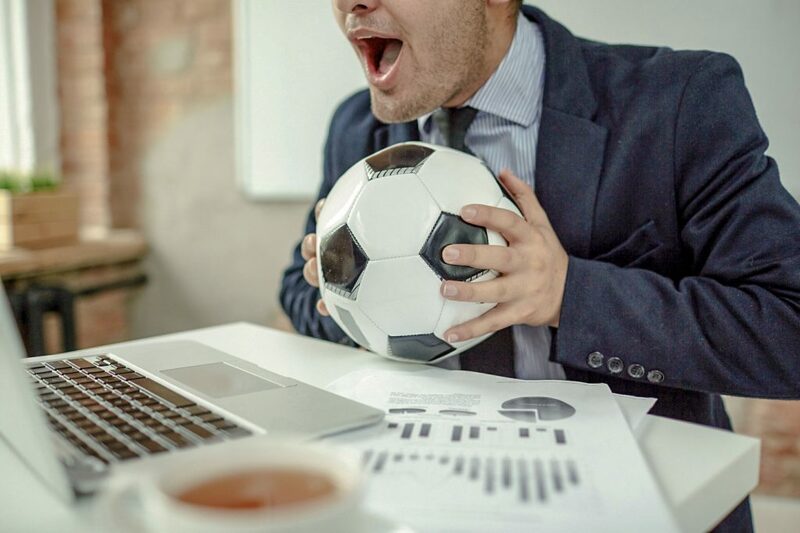 Even though it’s unlikely your staff will misbehave, make it clear to them that you won’t tolerate hostile, xenophobic or loutish behaviour directed at employees who support different teams, or even employees who aren’t interested in football. And because some of your workers may watch the evening games at a pub or bar, you may need to remind them to take it easy and not to turn up to work drunk or badly hungover. • Decorate your workplace with flags of the countries taking part. • Relax your dress code and allow staff to wear football shirts. • Organise a sweepstake—employees pay a certain amount and are assigned random teams. If their team wins the World Cup, the employee wins the prize fund. As long as you treat your employees like adults and they respect you in turn, you should have no trouble surviving till the final on the 15th of July, even if England don’t.